One of the things I love about my house is that I have a great fireplace with a HUGE mantle that I can decorate! The problem with this is, the mantle is so giant that many of the things I wanted to use to decorate it look dwarfed in comparison. I've lived in the house for a year and a half, and I think I finally have it (almost) just the way I want it. I love it! I painted my giant mirror from an old dresser set loosely following this tutorial. Those jersey ruffles on the candles are SO EASY. 2. Set your sewing machine on the HIGHEST tension and the LONGEST length. 3. Sew! It ruffles perfectly without any work! I made my yarn wreath using this tutorial. It was really easy too. Expect to see more of these - the possibilities are endless! These might be my favorite part. I just love them. I spray painted wooden candle sticks for the bases. The "kissing ball" on the left is made following this tutorial. The one on the right is made following this tutorial...and used more felt circles than I ever wanted to cut out in my life. 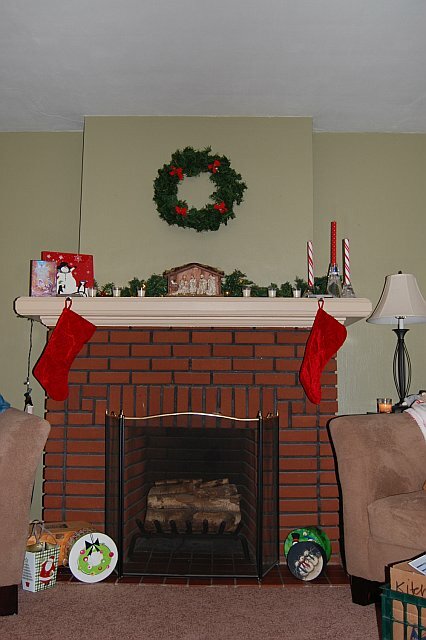 I posted my mantle pic on Facebook and asked for suggestions about what to put inside the fireplace. The big suggestion was candles. However - there are 5 candles on the top of the mantle. Plus, I used oil based primer on the bricks and I'm not sure oil based primer and fire are a good mix. My friend's mom suggested a fluffy Boston fern plant - and I love that idea! It will tie in my green color, fill up the space, and be easy to care for (since I'm planning to buy a FAKE one! ).